Ukai, or a fishing method which uses trained cormorants to catch river fish, conducted in the Nagaragawa River in Gifu Prefecture is now famous as a representative tourist attraction of the prefecture. The ukai fishing conducted in the goryoba, or the Imperial Fishing Ground, is called goryo ukai, which has an important role of serving the caught ayu (sweetfish) to the members of the Imperial Family. Moreover, the technique has been designated as an important intangible folk cultural asset of Japan. Thus, ,ukai is historically and culturally significant. One of the essential elements to support the ukai fishing technique is the cormorant fishing boat called ukaibune that is helmed by the usho, the cormorant fishing master. There is a fear, however, that the technique of building ukaibune will not be handed down to the future generations, as at present, there are only two funadaiku, or boat builders, capable of building this type of boat. 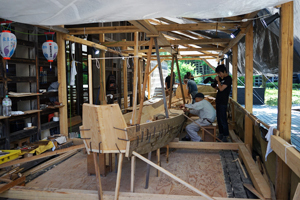 Under these circumstances, a project has started, in which Mr. Douglas Brook, a U.S. citizen, researcher of Japanese boats and funadaiku, who has experience in building tarai bune (tub boat) of Sado and sabani (small sail fishing boat) of Okinawa, has become an apprentice to 85-year old Mr. Seiichi NASU, one of the two remaining ukaibune builders, and is working with his master to build an ukaibune. 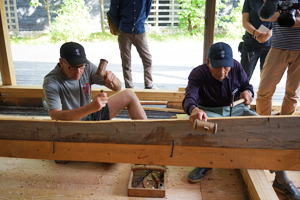 The Gifu Academy of Forest Science and Culture and the Tokyo National Research Institute for Cultural Properties participate in this project, the former providing a place for boat building and the latter producing a video record. The building of ukaibune began on May 22, 2017 and is scheduled to be completed in about two months. Agility and gracefulness are required in particular of ukaibune when compared to other wooden boats in general, and therefore, sophisticated techniques are required. It is a major target of this project to accurately and completely record the technique to help hand it down to the future generations. It is somewhat paradoxical that a non-Japanese is learning and mastering this traditional Japanese technique that is on the verge of extinction. We believe, however, that recording the intangible technique by positively taking advantage of this opportunity is one of the roles our institute should play since the conservation of cultural properties is our mission.